I’m sure we have all fallen into the trap of trying to make God fit in around us and for us to meet with him on our terms. 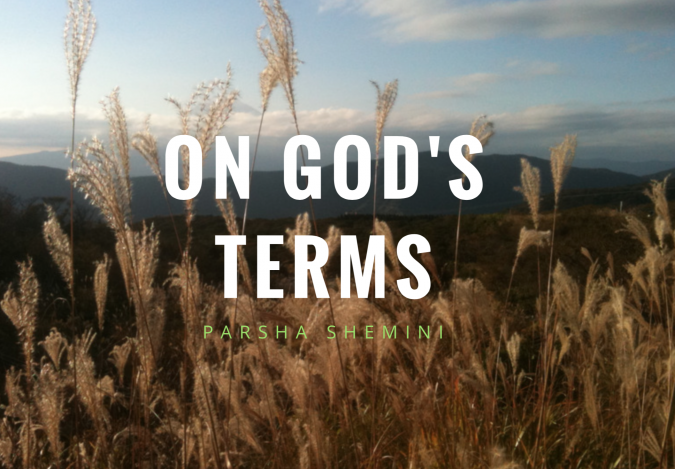 Well, this week’s parasha is an emphatic reminder that everything we do with God is on his terms alone, not ours. The Torah portion starts with all of Israel being gathered to witness Aaron making a sacrifice to God. With all of the people gathered, God revealed himself in glory and all of Israel fell face down and shouted with joy worshiping him. Aaron’s sons Nadab and Abihu then offered additional fire to the Lord and the two of them were consumed by the presence of the Lord and completely overwhelmed by God’s greatness, died instantly. The passage from 2 Samuel has a similar theme where Uzzah unneccarily takes hold of the Ark of the Covenant and is struck down as a result. The story of Nadab and Abihu shows us that we cannot have access to God’s glory on our own terms but on God’s terms. In the Tenach (Old Testament), these terms were to follow the laws and keep the regulations that God had given them and even then it was only the high priest that could enter into the holy place in the tabernacle. However, when Jesus became the perfect sacrifice by dying on the cross the terms to which we enter into fellowship with God changed for eternity. The picture portrayed of the glory of God given today in Leviticus and 2 Samuel might lead you to think that today the presence of God has been watered down so that we are able to access it safely. I’m pretty sure that none of us have been to a Church where someone has died from being exposed to God’s glory. So what’s changed? When we ask Jesus to be our Lord we can live a life where we encounter God because He is the holy sacrificial lamb without blemish. This week’s parsha reading gives us an indication of what God’s glory is like. It also highlights that we cannot get there on our own terms, as we learn from the attempts of Nadab and Abihu.